This wine has an aromatic savory top note quickly yields to an assortment of ripe fruit, across the spectrum of red and darker tones. The palate is fuller bodied and the texture is smooth and fleshy, and while generous, there’s a firm underlying acid base that gives drive and helps to balance out the fruit ripeness and keeps everything focused. The savory notes from the nose emerge on the finish adding a smoky, graphite, mineral-tinged note on the juicy, but dry finish. The grapes were de-stemmed and the whole berries were pumped into an open top stainless steel fermenter, with 5% whole bunches added to the ferment. The tank was inoculated with Enoferm Syrah, a Rhône isolated yeast strain. Punch downs were performed three times daily during fermentation. The wine was left on its skins for an additional five days of extended maceration before pressing. It was then racked to barrel for malolactic fermentation. The wine was aged for 18 months in 225 liter French oak barrels (10% new, balance second and third fill). The 2015 harvest was one of the earliest on record, occurring two weeks earlier than 2014. A very wet winter followed by a warm to moderate spring into summer resulted in a long (but early) ripening period. Warm (but not hot) and dry conditions prevailed throughout the harvest season, creating ideal growing conditions. Berry size and crop size were smaller than normal. 2015 was an exceptional vintage, resulting in wines of elegance and perfume, with concentrated fruit flavors and beautiful acidity. Rudi Schultz was smitten with wine from an early age, but it was a yachting journey from the Cape to North Carolina via the Caribbean that got him hooked on the winemaking profession. During his seven month adventure on the seas, Schultz had the opportunity to taste a number of top-notch Côte-Roties and Châteauneuf-du-Papes, as the yacht’s owner was an avid collector of Rhône bottlings. This first encounter with world-class wines had a profound influence on him, prompting a desire to craft wines of the same caliber and style from his native land. Grapes for the dazzling Rudi Schultz Syrah are sourced from a single vineyard site in the Bottelary Hills ward of Stellenbosch. The vineyard is located 16 miles from the ocean, at an elevation of 348 feet. The soil is a well granite-based “duplex” form, consisting of coarse sand on a gravel base, with a small percentage of wet clay. The hand-crafted wine is vinified at Thelema. 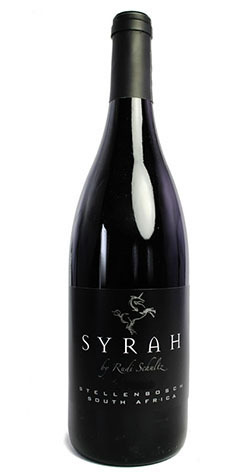 Hailed as a “small production gem” and a “delicious fruit-driven Syrah” that “maintain[s] a sense of freshness and minerality,” Rudi Schultz Syrah has earned a 90+ Wine Spectator rave in every vintage since its 2002 debut. The unicorn depicted on the label is part of the coat of arms of Schultz’s wife’s family. Winemaking runs in the Schultz family, as Rudi’s older brother Carl and younger brother Gunther are also talented winemakers. When not crafting his award-winning, critically acclaimed wines, Schultz enjoys competitive mountain biking, paddling, and surfing.